Lego-ise anywhere in the world. Hats off to Swedish designer Einar Öberg, who's used his coding skills to add a layer of Lego on top of of Google Street View. Head to Brick Street View and you can get a blocky view of any road in the world. Once you drop your Lego pegwoman into position, you'll see a pixelated mosaic giving the effect of Lego bricks (if you squint a little bit). 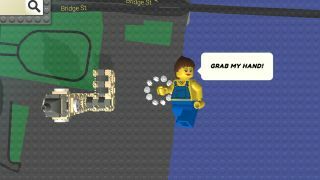 Lego roads, cars, trees and the occasional landmark are added for extra emphasis. It's a fun way to while away some time on a Sunday afternoon and if you want to know the software techniques that are used in Brick Street View then Öberg has written a detailed summary. The programmer is also responsible for the impressive Urban Jungle Street View - with this hack, roads are overrun by nature and look like scenes you'd come across in The Last Of Us or similar post-apocalyptic settings.